DCASE (Department of Cultural Affairs and Special Events) presents the 10th annual Creative Chicago Expo at the Chicago Cultural Center. The two day event kicks off Friday, and Saturday Honey Butter Fried Chicken chefs/owners Christine Cikowski and Josh Kulp give a keynote talk. All keynotes will be videotaped for future broadcast by Chicago Works and CAN-TV. The expo connects Chicago’s creative community with resources they need to thrive. Admission FREE. I&apos;ve been looking forward to this immersive maple experience since last year. Burton’s Maplewood Farm presents the the first and only National Maple Syrup Festival in Medora, Indiana. The two weekend event begins with your choice of an all-you-can-eat pancake, sausage, and — oh yes — real maple syrup breakfast at the Medora Community School, or breakfast served all day on the farm. 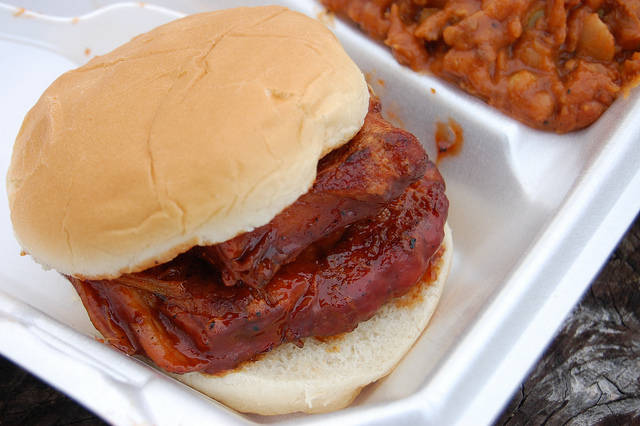 Beyond breakfast: maple BBQ pork chops, "SECRET RECIPE" maple baked beans, and more. I&apos;ll be back as one of the judges for the Sweet Victory Challenge presented by King Arthur Flour and the National Maple Syrup Festival. Admission $10 adults, $8 seniors (65 and over), $6 youth (5 to 15), FREE children (4 and under). Donate one canned good for a $2 discount; all donations benefit local food pantries. Chicago Foodways Roundtable presents Soup & Bread: Building Community One Pot at a Time at Kendall College. Mistress of S&B herself, Miss Martha Bayne, will speak, and yes, of course there will be soup and bread. Admission $3, FREE for Kendall students and faculty with ID. Glenwood Sunday Market presents the 4th annual Heat it UP!! Chili Cook Off Contest and Festival at The Glenwood Bar. Cash prizes for first, second, and third place chili winners! Plus prizes for the most chilis tasted by a taster. Admission $10 for tasters, $15 for chili head chefs (entries due Thursday, February 28). Common Threads presents the 7th annual Chicago World Festival at Soldier Field. Best known as former Oprah chef Art Smith&apos;s charity, the non-profit celebrates its 10th anniversary this year. The festival draws celebrity chefs from around the city and the world. Admission $250 general, $500 World Festival VIP, $1,000 Chef Experience VIP, $150 Chef After Party. Jane Addams Hull-House Museum presents Re-Thinking Soup at the Hull House Kitchen. This month, a conversation with the author of Behind the Kitchen Door, Saru Jayaraman (foreword by Eric Schlosser), on sustainable restaurants, labor practices, working conditions, and wages in American restaurants. As always gather together and eat delicious, healthy soup, plus bread by Nicole&apos;s Divine Crackers. Admission FREE. Soup & Bread presents this week&apos;s theme, The Ground ("soups of the subterranean world") at the Hideout. Very special soup chefs this week include the one and only Edzo, chef/owner Eddie Lakin of the eponymous burger and shake shops. Plus bread from Publican Quality Meats and La Farine Bakery. Admission FREE, by donation. Follow me on Twitter at @louisachu.